Created specially for modellers of American railroads everywhere. 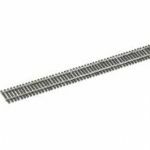 83 Line items are realistic models of Norh American railroad track, with code 83 nickel silver rail. Scaled from prototype drawings and tooled with the latest CADCAM technology, this Code 83 product range features authentic tie sizes and spacing, the standard American number system for frog geometry, plus a very fine scale representation of the traditional rail spike fastenings. This whole range of HO track is designed specifically from A.R.E.A. drawings and conforms to N.M.R.A. STANDARDS. All Turnouts and the Diamond Crossing are available with a choice of Insulfrog and Electrofrog versions. One item - the 90 degree Crossing is available as Insulfrog only.